Nissin CURRY Ramen Noodle Cup-o'-Noodles - Commercials I Hate! LOVE this stuff - I buy it whenever I can find it (and THAT has been really HARD). Given the high fat, carbohydrate and sodium content, they should just come right out and call it Cup O' Death. Cracked Pepper & Olive Oil Triscuits are addictive...I've been on them for years. Many of you would not be familiar with Triscuits as this is a 'food for snobs', or better put, 'food for those of us that matter' (The 1%). You know what? I may share a Triscuit with any who kiss my tail, should I find them 'worthy'. How can a cup of processed soup satisfy you? Those ramen noodles are pretty damned good!!! I wish I could still eat them. I couldn't go without noodles for more than a week. Not necessarily these, but some sort of noodles (preferably spaghetti). Luckily, my sugar levels are OK. It's the damned cholesterol I have to worry about. Zucchini noodles otherwise known as "zoodles". 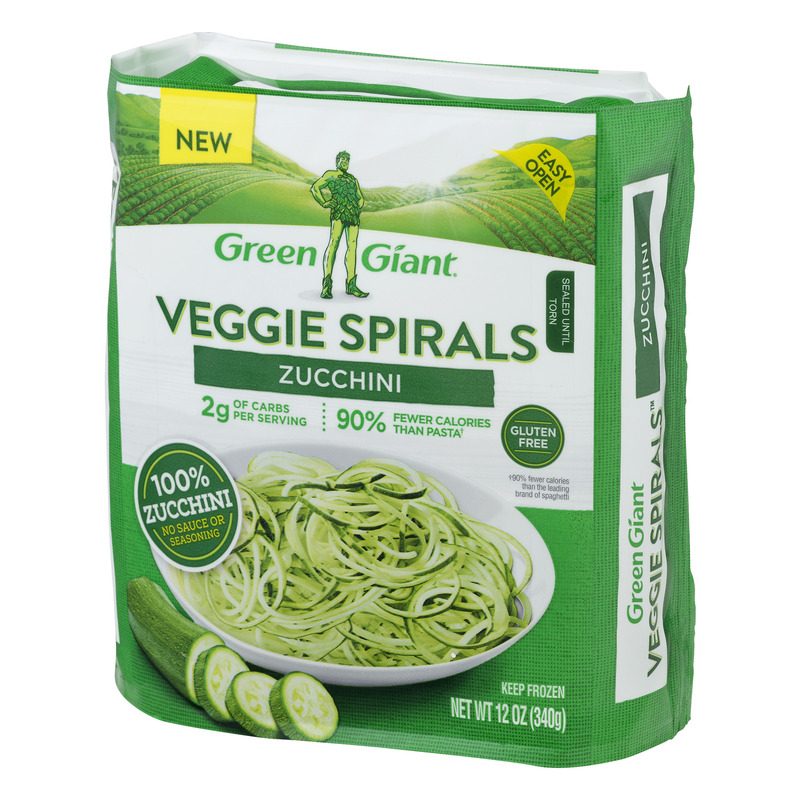 Supposedly very similar to actual spaghetti, but a fraction of the carbs and I'm guessing, fairly high in fiber. Put some good meat sauce all over it and it might pass. The cost is about $2.48 per 12 oz. pkg at Walmart. Back when I was cooking for my working wife, spaghetti was a popular favorite. I was more active and capable back then too. A pound of ground beef, some Preggo (garlic basil oregano) sauce. Some garlic bread and a tossed salad too! We don't cook at home much anymore. The last time I had spaghetti was on Christmas Day last year. Made the sauce in the crock pot with meatballs and Italian sausage. Maybe when the weather cools down next month or so, I'll make some of those zoodles with meat sauce. Maybe even bite the bullet and do some garlic bread sticks. Of course you can still eat them! What happened? Did someone point a shotgun at your jaw and blow the bottom-half of your face off? Do you just love supporting your doctors so they can pay off their Audis? Is anyone even alive that depends on you or is anyone even alive that would fall to pieces when you croaked? Do you have a completed will that includes donating property nobody else wants? Get rid of all the excess baggage NOW and spend your children's (or other loved ones) inheritance! Eat whatever you want and party until the end, but especially eat this because it has CURRY in it and everyone knows CURRY is not only good for you, it is heavenly for the soul - far better than chicken soup. Having said this, don't try to convince yourself that I am right and it is time to take that 'leap of faith', no! Call all of your friends together, collect those funds, sending the required 80% cut to me, and we will book a special location where I can come and 'spread the word'! My bro tried something like that. Trick noodles just didn't do the trick, according to him. He's diabetic, but he eats pasta (whole wheat) almost every night. He eats pretty healthy otherwise, so he says the pasta's OK. Whole wheat pasta is good for you unless you have celiac disease, which is the only medical reason to eat gluten free. Eating gluten free just to follow the fad doesn't count, although some people think they feel better (placebo effect?). It's what you put on the pasta that could cause problems, such as butter, too much cheese, etc. Even whole wheat pasta has a lot of carbs. It might have a bit more fiber than regular pasta, but it's still high carb. I have to stay away from it for awhile longer. Maybe in a few more months if I lose a few more pounds, I can start eating things like pasta again. I know that come Thanksgiving and then again at Christmas I'm going to forget the diet for awhile and indulge in some food I've been depriving myself of. I've had my eyes on a couple of pies at Walmart. I think I may die and go straight to heaven! I do not think there can be better food. This is like setting out antifreeze for the dog, I suppose - if there was ever a need or desire to kill me, this would accomplish it. The white cheddar my favorite and is great on pizza, too!!! ^^^Thank You, ol'Mule! I've never seen those before...I bet I can use them! Actually, I think the top two are the same thing, just one picture is a little darker than the other. The white cheddar is tasty, though.